While surfing the blogaverse last week one recipe in particular caught my attention. Marie from Proud Italian Cook had posted some irresistible photos of Eggplant Patties. 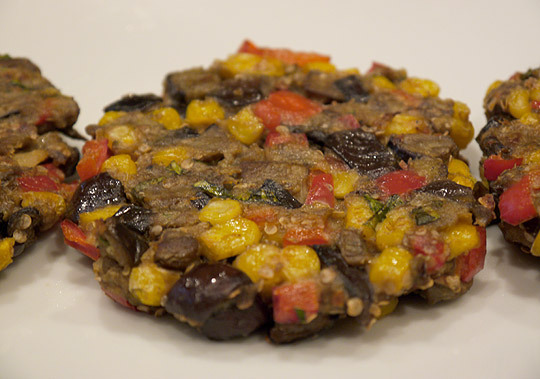 It might sound odd: eggplant patties…but I knew immediately I was going to make them. So on my weekly visit to the farmer’s market I picked up a few eggplant, a red bell pepper and some corn on the cob. Mixed with fresh basil and parsley from my garden and a handful of grated Pecorino these patties are super simple to make and super yummy to eat. So simple that you really don’t even need a recipe…just sort of go by taste. But for those that need one here’s what I did. Place your eggplant and peppers on a baking sheet along with the garlic cloves, drizzle with olive oil, salt and pepper and roast in a 425 degree oven until soft with a little color, around 20 minutes. Let everything cool. When cooled place in a bowl along with the rest of the ingredients. Mix altogether and form into patties. Place patties on baking sheet drizzle top with olive oil and bake in 425 degree oven until browned, flipping once. Love that you baked these instead of frying. I guess we're both in eggplant moods this week! What a nice way to use eggplant. I've had eggplant burgers but that was with a large piece of grilled eggplant. I'm going to try this recipe. Thanks. So glad you liked them, yours look yummy, nice and "corny"!